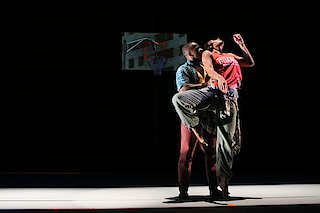 Kyle Abraham’s dance language is fierce and tender, he unites power and grace – and brings us down to earth. Kyle Abraham sets the history and current situation of black America in his hometown of Pittsburgh, once famous for jazz legends like Ella Fitzgerald and Duke Ellington. Now, we gaze at the lost and lonely in their ghettos. How are we to deal with the situation? Pull out or commit ourselves to changing it? Abraham has made his decision. Born into the hip-hop culture of the 1970s the dancer and choreographer set up his own company in 2006. Since then he has been fighting for a better world with classical and street dance.